Prices are per room, per couple, including full hot and cold breakfast each day with plenty of peace and tranquillity thrown in. Don’t forget to check out our Specials and our Gift Vouchers for regular accommodation deals. For bookings of 5 or more nights please contact us for prices. Gift Vouchers can be purchased for any value or for one or more night’s accommodation in a specified room. Please read our Terms and Conditions for further information and details of our Cancellation Policy. Promotion available for bookings from 19th Nov to 28th March 2018. Available on (Sun/Mon) (Mon/Tues) (Tues/Wed) (Wed/Thurs) nights. Phone bookings on 07 5545 2365 or email enquiry. Please quote ‘SUMMER SPECIAL – Wine and Cheese Platter’. Book 3 nights, Fri/Sat get Sunday Night Free in one of our Luxury B&B rooms with spectacular mountain views, and save nearly 30% our regular price! Promotion available for bookings from 1st Dec to 31st March 2019. Available for bookings on (Fri / Sat / Sun) nights only. Please quote ‘SUMMER SPECIAL 2 – “Stay 2 nights get 1 night FREE”. Subject to availability. Not available 21st Dec to 10th Jan 2019. Thrill that someone special with a gift that will be remembered for years to come. 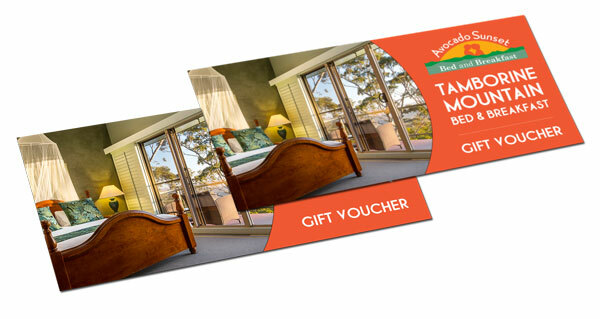 Gift Vouchers can be purchased for any value or for one or more night\’s accommodation on beautiful Tamborine Mountain in any one of our unique themed rooms. An Avocado Sunset Bed & Breakfast, luxury Mt Tamborine accommodation getaway is a perfect and highly memorable gift that will be remembered fondly for years to come. Take a closer look at our luxury themed rooms to help choose a superb ‘destination’ for that unique person in your life …..
View our accommodation rates above and purchase an Avocado Sunset B&B Gift Voucher that fits your budget….. If you need any assistance or an additional spot of creativity or genius to help construct your special gift, please contact Cheryl or Richard who will be only too pleased to help you put together a package that will thrill that someone special that you are buying for.